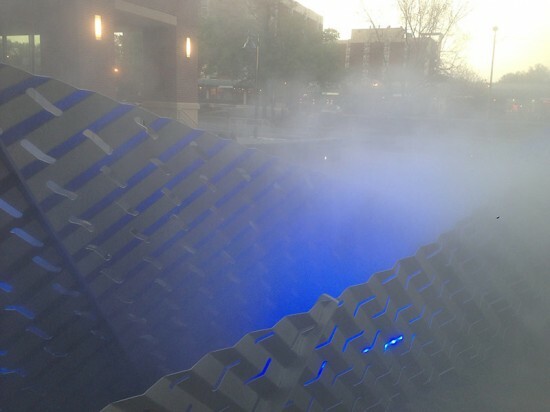 Amuneal Manufacturing fabricates a “breathing” sculpture for a North Carolina plaza. 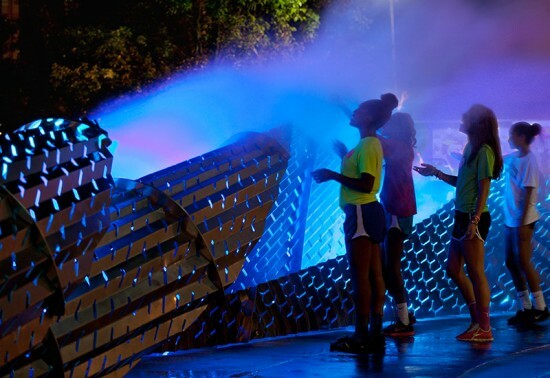 For a public plaza in downtown Chapel Hill, North Carolina, landscape architecture firm Mikyoung Kim Design designed a unique sculptural installation that doubles as a stormwater management system. 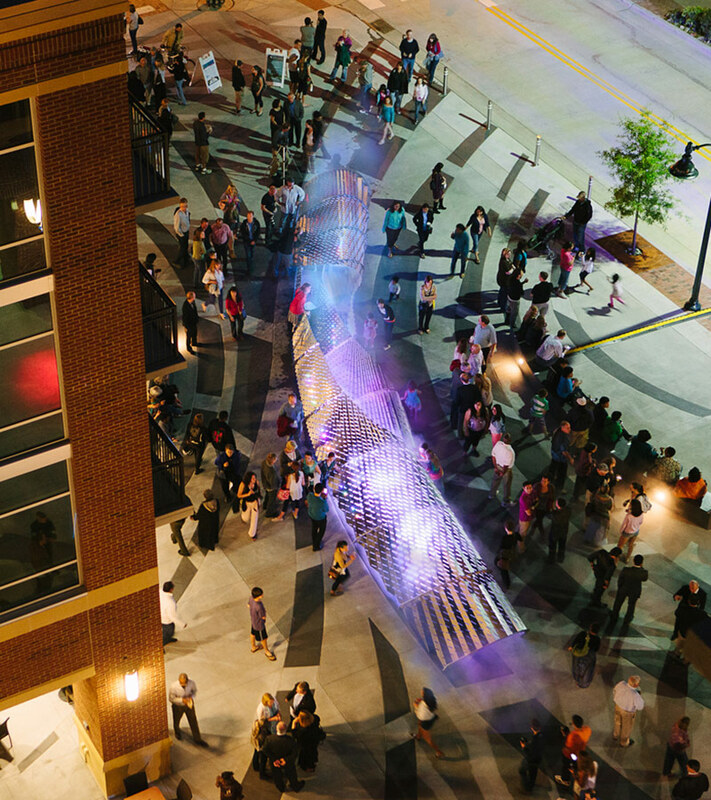 The 70-foot linear form is centrally located to engage the town’s residents with a looped, 10-minute light show. A misting sequence, drawn from a subgrade cistern, emanates through the perforated metal skin of the sculpture, giving the impression that “Exhale” is actually a living, breathing object. The original concept for the piece incorporated hydrological elements of the site in an engaging and transparent way, but the form was less defined. 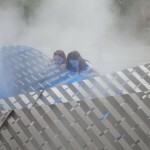 Over the course of nine months, designer Mikyoung Kim said her team designed countless rock-like shapes from clay, carving each from the inside out to achieve a thin, amorphous shape that consistently collapsed in on itself. Then, one night at home, Kim had a breakthrough when her idling hands picked up a few sheets of trace paper in the early morning hours. “I started folding a piece of trace paper and kept folding, and folding,” she recalled. “It was yellow and easy and beautiful; I fell in love with that.” The sheets also helped Kim balance her aim for delicacy with function and helped define Exhale’s fan-like corrugation. 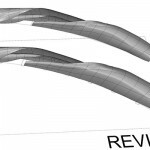 Through a series of quarter-scale mockups and Rhino drawings, the team worked to refine the size of the sculpture’s perforations, a process Kim likened to “squinting to make it clearer.” There are more perforations on the top than on the bottom, giving the impression of a sturdy base with a lighter feeling above. 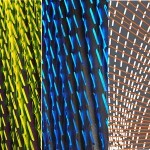 Another challenge came in integrating the corrugated, perforated surface with a support structure. 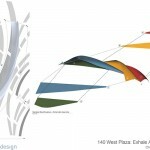 Parametric scripting helped Kim dictate where the perforations would fall in relation to the framing elements. Kim turned to long-time collaborator Amuneal Manufacturing to fabricate the design. Amuneal converted the drawing from Kim’s Rhino files to Solid Edge. 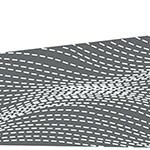 Those files were used to laser cut the sheet’s trapezoidal geometry and perforations from marine-grade stainless steel sheets. 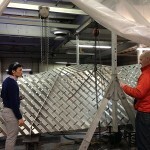 Amuneal’s CEO, Adam Kamens, estimated that almost 50 sheets where welded together to create the final form. 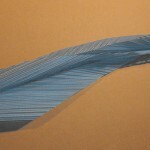 Radial corrugations were folded on a CNC press brake. 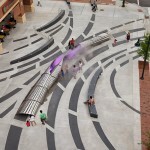 Because Exhale was designed for a plaza that wasn’t perfectly flat, Amuneal executed as much pre-assembly in its Philadelphia facility as possible. Sheets as large as the bed of a truck were craned into place and welded together on site. Abrasive finishing smoothed over seams and connections. The curved, stainless steel sheets conceal an internal misting tube that releases vapor through a high-pressure spray, as well as color-changing LEDs.